I have the original Paper Pumpkin design in the background of some of my samples but above are the Stampin Up! designs and the products in the kit. These kits are such a great deal! You get everything you need right down to the dimensional and adhesive dots. I love that you also get a chance to try out different ink colors with the ink spots. The kit comes with a sweet little cloud stamp but I needed something a little bolder to balance the polaroid die cut. I used the clouds from the Papertrey Ink Sunshine and Rainbows Make It Market Mini Kit to inlay the stitched border clouds in blue stock. (This kit is such a steal for only $30!) I accented the bottom of the card with washi tape from the Paper Pumpkin and rounded the corners with a Cropadile Corner Chomper. A little twine was a nice accent for the top of the card. This was the PERFECT design to go with one of my favorite Dr. Seuss encouragement quotes “You’re off to great places today is your day, your mountain is waiting so get on your way!” I borrowed this sentiment image from Pinterest, printed it, adhered it to the inside of the kraft card base and added a silver border to for a little extra accent. I love how the Hooray rhymes with the “today is your day." For this variation I completely covered the heart die cut with the pink washi tape and stacked the pink and green strips of card stock from the kit. I used the notecard card base and coordinating envelope for this card. The flower woodcuts were just two cute to have only on a couple cards so, like the card above, I added one as a simple accent to coordinate with the “love” woodcut. I used the Tranquil Tide Stampin Spot from the kit to stamp the “you” sentiment and cut the left edge at an angle to tuck it under the “o” of the “love” woodcut. I die cut a kraft panel with a rectangle die from Sizzix. I wrapped and tied gold thread from a previous Paper Pumpkin around the panel and adhered it to the card base. For the next two cards, I modified the original design just slightly. This Heidi Swapp Thank You die uses such a beautiful font (I originally purchased the die for my sister’s wedding thank you cards, will post at a later date). I die cut the thank you from the watercolor stock and added a few sequins. I did the same for this card. 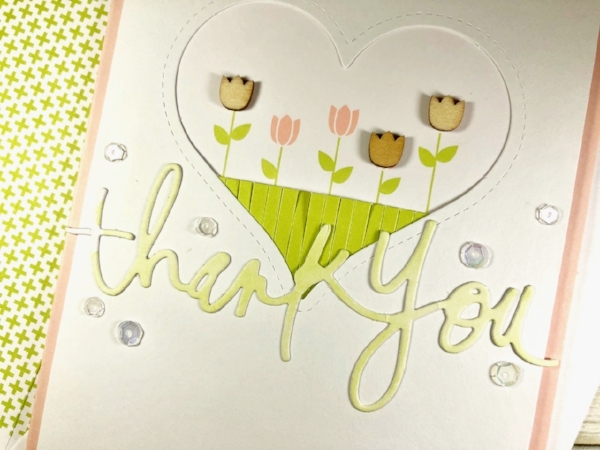 I kept the original Stampin Up design with the "You're the Best" sentiment but added a "thanks" die cut from the Winnie and Walter In a Word: Thanks Cutaway Die Cut from the watercolor stock. A strip of washi tape from the kit and a few sequins finish it off. The next two cards use the same dies as above but with the watercolor notecards that I die cut them from. 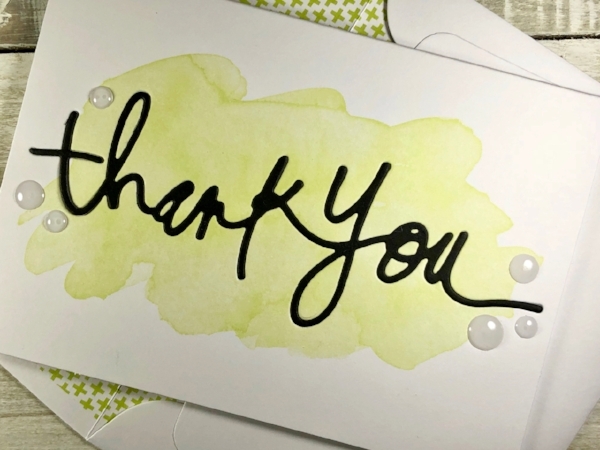 I inlaid the Thank You in the notecard and added a few enamel dots. Very quick and simple. Never throw away scraps, am I right?? I kept this Thanks die cut from a watercolor background I created for one of the cards shown below. I thought it matched perfectly with the watercolor notecards included in the kit. I added a punch from a Martha Stewart butterfly out of the blue stock. I apologize, I do not have the link this card design was inspired by. It is not my original design. This last card is completely different from the kit designs. I used the blue washi tape to completely cover the circle die cut as the kit design instructs but then used the Layering Circle Framelits Dies to frame the circle. The #nailedit sentiment is from the Bossy Joscie Hash Tag Stamp Set. 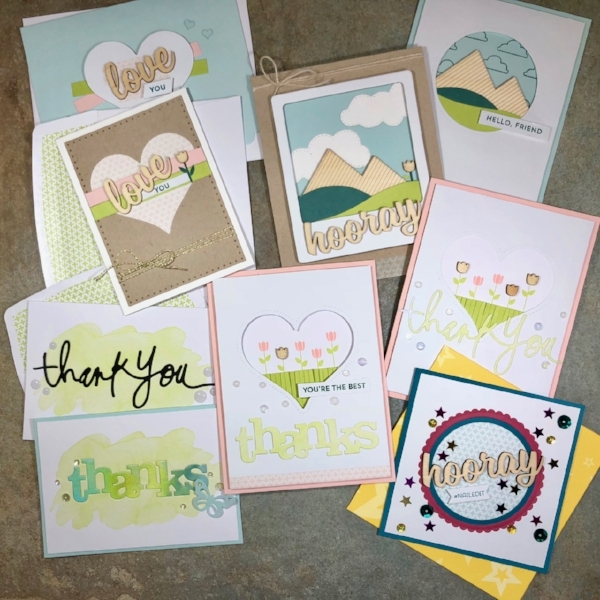 Thank you for checking out these Stampin Up Paper Pumpkin July 2017 Positively Picturesque alternative. I hope you are inspired to stretch your kit supplies!